Sergio's LEGO Ghostbusters headquarters has not made it past the LEGO Ideas review stage. I suspect the size of the project might have had something to do with it. 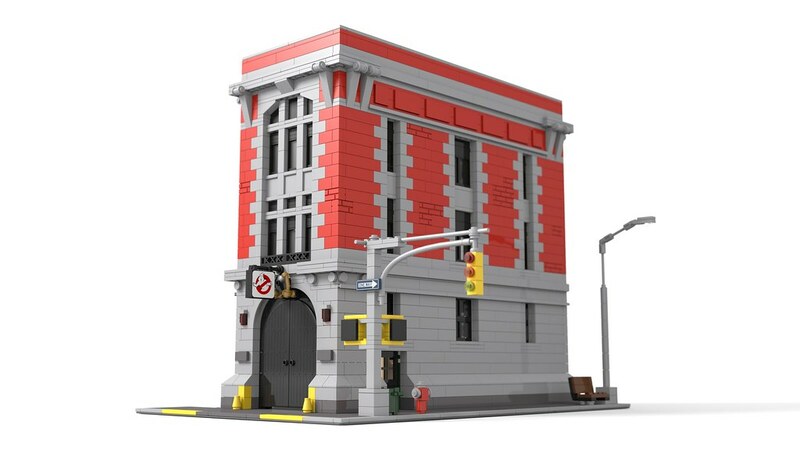 Sergio's LEGO Ghostbusters headquarters with interior included is made up out of 5704 bricks. To date there have only been two official LEGO sets which consisted of more than 5000 bricks. 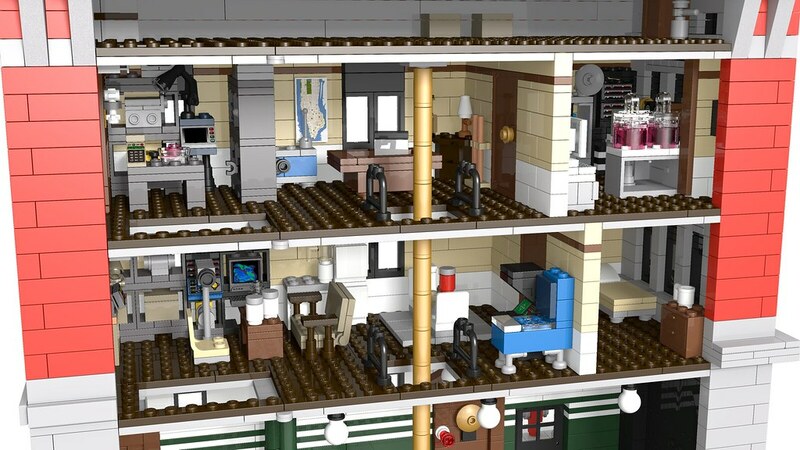 With that in mind I have designed a smaller LEGO Ghostbusters headquarters in the same scale as the LEGO modular buildings. The backside of the building has been left open for playability and display. For even better access the stairs can be removed. The interior has been recreated as faithfully as possible from the Ghostbusters movies. The wall panel with the bell and the office area were quite a challenge. They are build half sunk into the double walls. The blank square behind Venkman's desk is supposed to be a framed black and white photograph from the original Ghostbusters movie. I still need to make a legofied version of this and add it in. I've included, among other things, a camera and monitor setup showing a terror dog, a "last of the petty cash" meal, a dancing toaster, and jars of slime. At some point I would like to do a side-by-side comparison of screenshots from the movies and the LEGO versions. The pinball machine is supposed to have a Star Gazer backplate. I still need to make a legofied version of this and add it in. 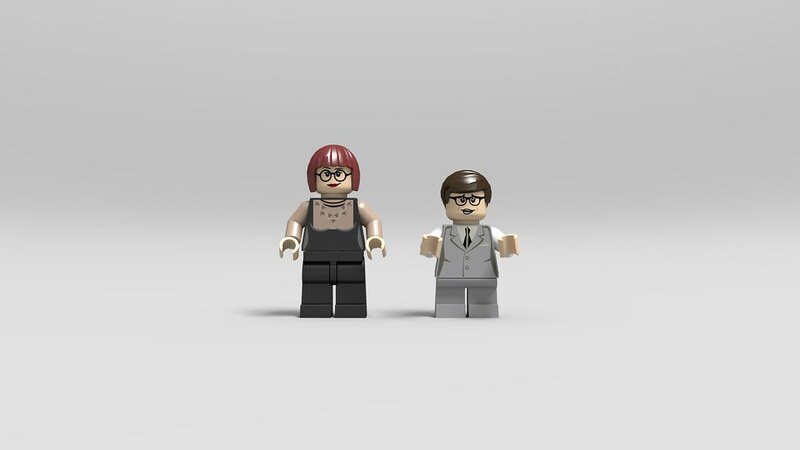 Janine Melnitz and Louis Tully minifigures. 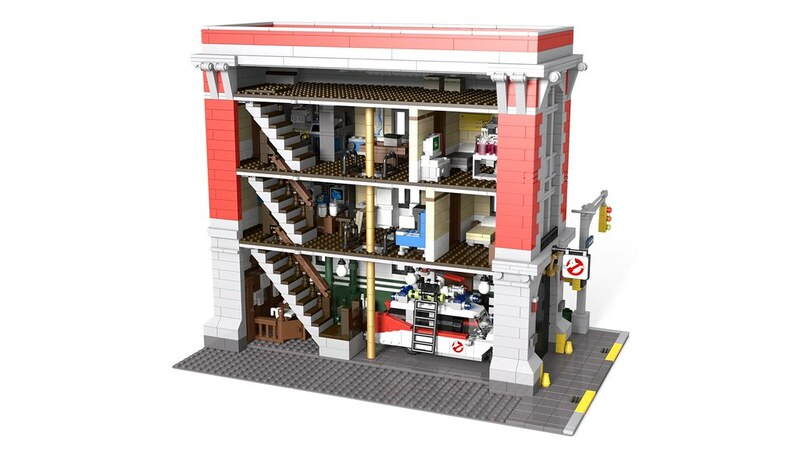 Making a smaller Ghostbusters headquarters does require a smaller Ecto-1. Brent's Ecto-1 unfortunately won't fit inside the building, at least not without removing a large part of the ground floor interior. 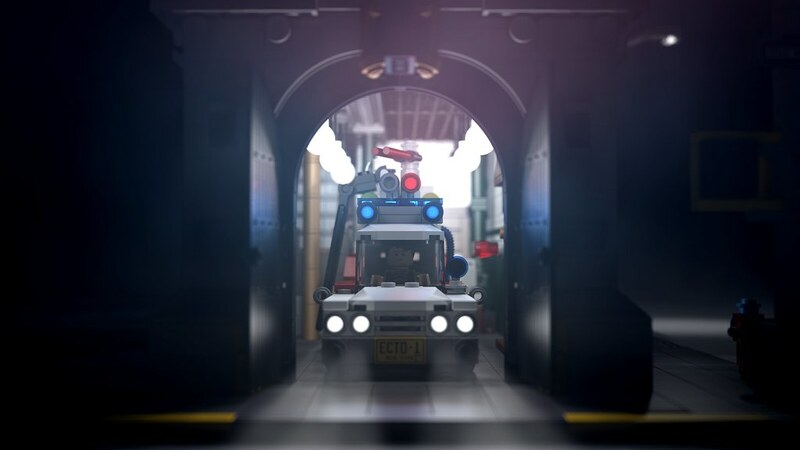 But perhaps LEGO could include the smaller version of Ecto-1, similar to how LEGO included a smaller version of Metalbeard in Metalbeard's Sea Cow set. 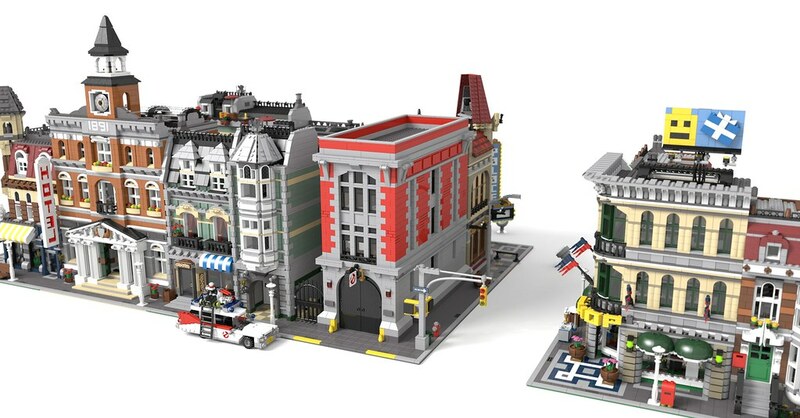 The number of bricks used comes to 3008 bricks with the smaller Ecto-1 not included, and 3264 bricks with the smaller Ecto-1 included. 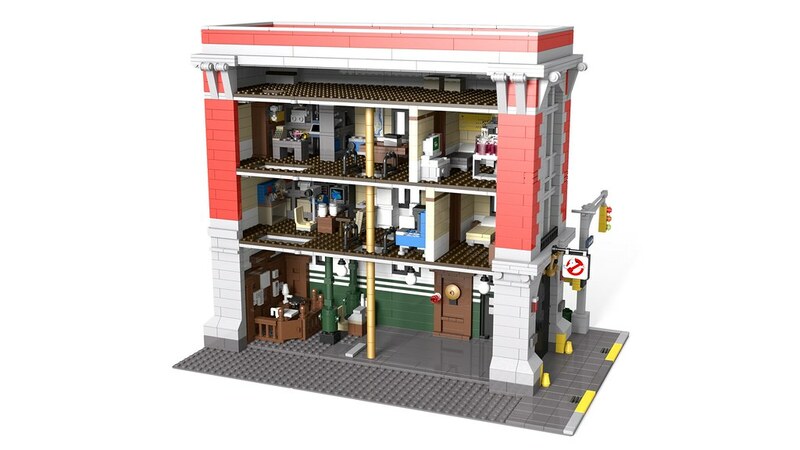 Which would mean the LEGO Ghostbusters headquarters would cost somewhere around €190 with the smaller Ecto-1 not included, and somewhere around €210 with the smaller Ecto-1 included. I've submitted this building on the LEGO Ideas site. It currently has about 4000 supporters, so it can still use some support. 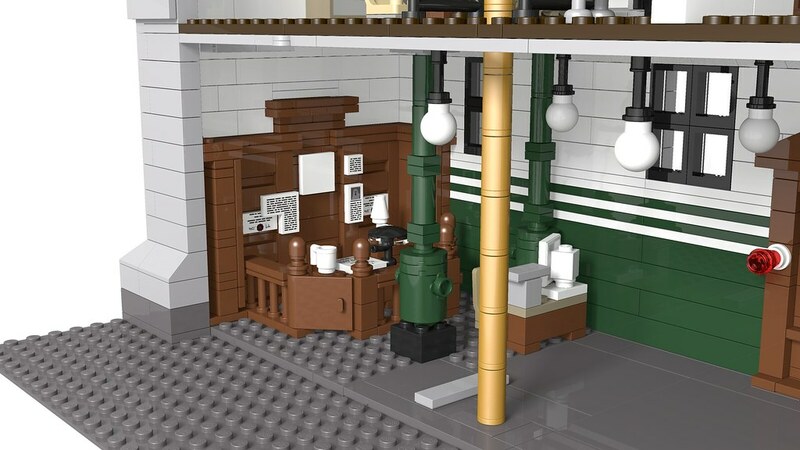 Help make this become a real LEGO set and support! Like it very much, it will get my support! Maybe a good idea for the Modulars line to get a few licenced variatons just like the CMF's did for TLM and Simpsons. I mean, why not? This is amazing! I collect modular but the lack of playability keeps me from leaving out to long. Your solution to this is superb! In the very unlikely event that your project does not receive the support needed to make it to the next phase with Lego Ideas do you have any plans to build one of these or release (sell) the instructions? I'd be very interested in putting one of these together. Great Build Mighty Maus. Good look and I hope you reach the 10,000 vote mark. There is lot's of play ability with this creation and wouldn't worry too much about the TLG Ecto 1 fitting in as you have added your own scaled down version to go with the build. I'll certainly vote for this. I built one a while back when Sergio's had just arrived unto the world. I liked his design so I played with it for ages and come up with a small version, it's currently on ebay if you want to see pictures. I have updated my design. The images in the original post have been updated to show the new design. I have mostly added extra detailing on the outside of the building. I have also made a new rendering which shows the size of the LEGO Ghostbusters headquarters relative to the existing line of LEGO modular buildings. Help make this become a real LEGO set! Go to the link below and support!